You can design your questionnaire more dynamically by defining, which pages or questions should be shown or hidden under which conditions. Just click at a respective page or question, that needs to be shown or hidden depending on the given answers, on the button “display conditions“. Thereby a menu pops-up, that allows you to define conditions, under which the requested action (show/hide page or question) should be executed. Now you can choose the answers (yellow buttons) in the previous question, which should lead to the before defined action (show/hide). It is essential, that the affected questions are not on the same page. Otherwise the before mentioned yellow buttons will not appear and the display conditions cannot be defined. 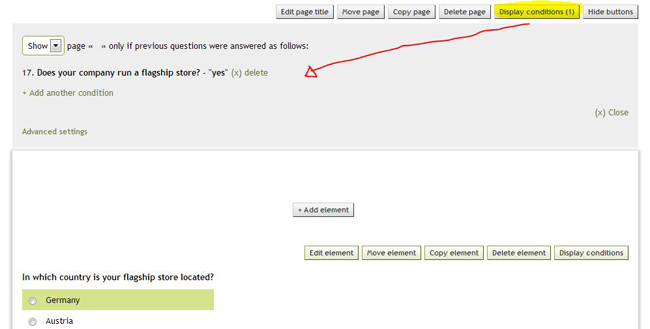 In the above mentioned example the page will be only shown, if the previous question is answered with “yes”. 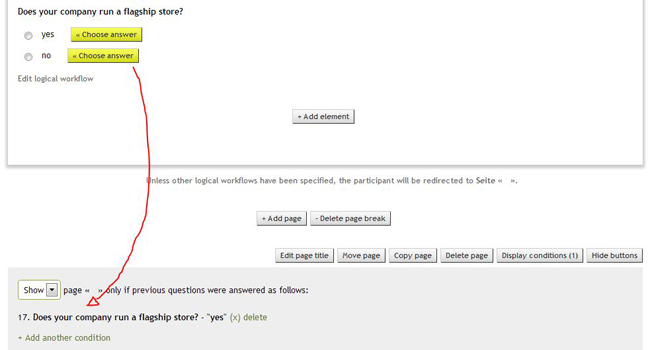 In the case a participant selects “no”, the page will be skipped and the following page will be shown instead. Furthermore you can also define advanced display conditions based on dynamic contents or URL-parameters. Posted on November 18, 2014 Author Pascal SchenkCategories What's New? Next Next post: How can I avoid multiple participation?